Reason for distillate treatment :The low operating temperature of the evaporator , is not sufficient to sterilize the product. Despite precautions near the coast, harmful organisms may enter with the sea water and pass through to the domestic water tank and system. Additionally there is a likelihood that while in the domestic tank, water may become infested with bacteria, due to a build up of a colony of organisms from some initial contamination. Sterilization by the addition of chlorine, is recommended in Merchant Shipping Notice M1214. A later notice, M1401, states that the Electro-Katadyn process in use since the 1960s, has also been approved. Another problem with distilled water is that having none of the dissolved solids common in fresh water it tastes flat. It also tends to be slightly acidic due to its ready absorption of carbon dioxide (CO2). This condition makes it corrosive to pipe systems and less than beneficial to the human digestive tract. Initial treatment (Figure 1) involves passing the distillate through a neutralite unit containing magnesium and calcium carbonate. Some absorption of carbon dioxide from the water and the neutralizing effect of these compounds, removes acidity. The addition of hardness salts also gives the water a better taste. The sterilizing agent chlorine, being a gas, is carried into the water as a constituent of sodium hypochlorite (a liquid) or in granules of calcium chloride dissolved in water. The addition is set to bring chlorine content to 0.2 ppm. While the water resides in the domestic tank, chlorine should preserve sterility. In the long term, it will evaporate so that further additions of chlorine may be needed. The passage of water from storage tanks to the domestic system, is by way of a carbon filter which removes the chlorine taste. 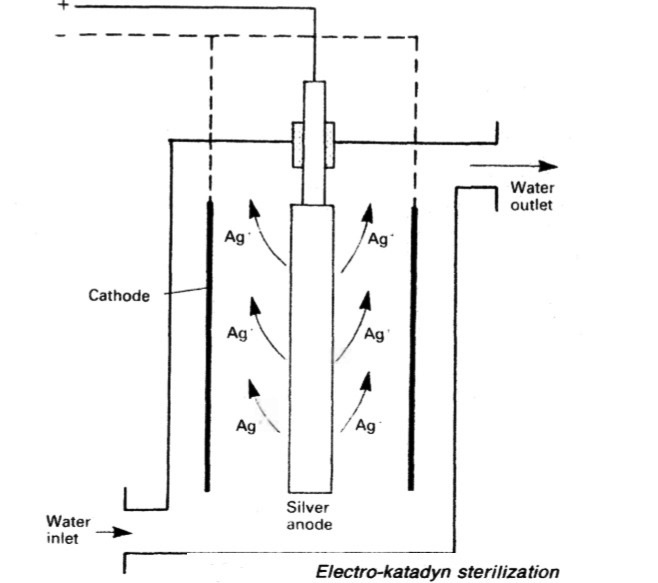 The Electro-katadyn process (Figure 2) accepted as an alternative to chlorination (see M1401) involves the use of a driven silver anode to inject silver ions (Ag+) into the distilled water product of the low temperature evaporator. Silver is toxic to the various risk organisms. Unlike the gas chlorine, it will not evaporate but remains suspended in the water. The sterilizer is placed close to the production equipment with the conditioning unit being installed after the sterilizer and before the storage tank. The amount of metal released to water passing through the unit, is controlled by the current setting. If a large volume has to be treated, only part is bypassed through and a high current setting is used to inject a large amount of silver. The bypassed water is then added to the rest in the pipeline. With tow water flow, all of the water is delivered through the device and the current setting is such as to give a concentration of 0.1 ppm of silver. The silver content of water in the domestic system, should be 0.08 ppm maximum. A means for sterilizing potable water at the point of use, is provided on many offshore installations and ships, by an ultra-violet radiation unit which is positioned after the hydrophore tank and as close as possible to the tap supply points. The stainless steel irradiation chamber contains low pressure mercury vapour tubes, housed in a quartz jacket. Tubes are wired in series with a transformer for safety. A wiper is fitted within the chamber to clean the jackets and lamp observation window. Units of a similar type are used for pretreatment disinfection in some reverse osmosis plant.